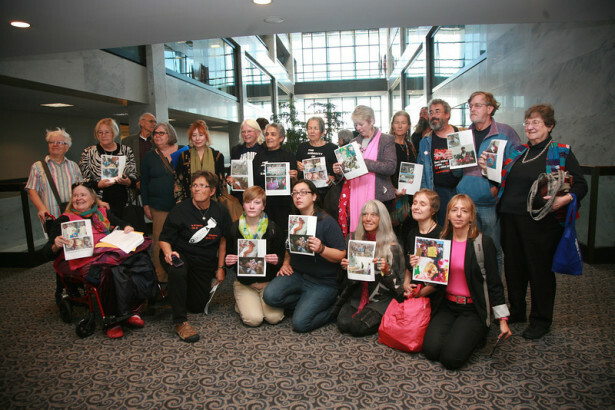 Attended by some 400 participants, the drone summit organized by Code Pink last weekend signaled another important milestone in the growth of the anti-drone movement. An organizing summit held this past weekend at the Georgetown Law Center in Washington, D.C. — called Drones Around the Globe: Proliferation and Resistance — signaled another important milestone in the growth of the anti-drones movement. With 400 participants, including people from nations regularly under drone attack, the conference was a mix of research, analysis, networking and concerted movement building. The news delivered at the gathering was grim, but the convergence gave attendees a sense that the struggle is gaining traction, both in the United States and internationally. To underscore this point — and to emphasize that change will not come without public protest — dozens of the participants reconvened on Monday morning to peacefully occupy the office of Sen. Charles Schumer, the New York Democrat who supports U.S. drones policy. After several hours, four were arrested as part of this action organized by the National Campaign for Nonviolent Resistance. This tip of the hat to Code Pink and its tireless change agents, including the redoubtable Medea Benjamin, likely not only expresses gratitude for the skillful way it pulled this particular conference together, but also for the critical role it has played in nurturing the movement for the past half dozen years. Code Pink and a smattering of other local, national and international groups and coalitions have, little by little, laid the groundwork for the emergence of a powerful and effective movement for change. The anti-drones movement has been slowly gaining momentum — from small actions at drone bases in the Nevada desert, to a sprinkling of civil resistance events at other bases and facilities in the United States and United Kingdom, to publishing research, to making the strategic global connections, to confronting policymakers (including Benjamin’s vociferous engagement with President Obama earlier this year), to seeing one activist earn a six month prison sentence for a nonviolent drones protest while another group of activists elsewhere was acquitted. Although we’d like to see change come quickly, this is rarely the case. Social transformation navigates many contending forces as it seeks to change a society’s mind. One of the better maps for understanding this journey is the late Bill Moyer’s Movement Action Plan. This model is useful for understanding where the anti-drones movement happens to be at the moment — and where it could be going. In Moyer’s model — detailed in his book, Doing Democracy — a movement’s success hinges on its ability to alert, educate and mobilize the public on whom the policymakers ultimately depend for their power. To this end a movement must win the public three times: it must convince it that there’s a problem; it must convince it to oppose the status quo; and it must convince it to support the movement’s alternative. All of this convincing does not happen at once. It’s an often long-term process of amassing people power, which Moyer conceives of as successfully traversing what he called “The Eight Stages of Successful Social Movements.” Taken together, these stages represent an evolving sequence of typical challenges and opportunities faced by a movement for change, with each phase building on the last. Not only can this help locate where we are in the life-cycle of our struggle, it can help us see how — even though we haven’t achieved our ultimate goal yet — we have likely been meeting the goals of the stages we have been moving through. We don’t criticize a sophomore in college because she hasn’t graduated, but in social movements we often criticize ourselves for not having already achieved our goal. Moyer’s schematic helps us see that we likely are sophomores or juniors or seniors, progressing along. Though many movements are not neatly confined to four years like many college careers — they can take decades, or longer — their ultimate success hinges on a building process and the momentum that it can generate, with one “semester” built on the last. Moyer’s eight stages are: business as usual, exhausting the remedies of the system, ripening conditions, take off, perception of activist failure, majority public opinion, success and continuing the struggle. Without going into a detailed application of this model to the anti-drones movement, Moyer would probably suggest that it is cruising through the third stage and laying the groundwork for take off. The movement for a drones-free world has played a key role in raising the visibility of this issue — sounding the alarm years before most people had ever heard of drones — and then carrying out a series of nonviolent skirmishes that have exposed and exacerbated the contradictions and festering issues that a drone-ridden world entails. A measure of the success of this was seen in a New York Times article on another drones conference that took place last month. Unlike this past weekend’s gathering, the Drones and Aerial Robotics Conference held at New York University was meant to be an unabashed drones love fest touting their civilian potential. But, as the article stressed, the moral issues stemming from the U.S. government’s killer drone program relentlessly cast a pall over the proceedings. It has begun to saturate the social circles of those who might care about this kind of thing, begun to win the support of established organizations like Amnesty International, and started to knit together an increasingly far-flung network of individuals and groups. But it has not yet achieved take off. Moyer’s fourth stage is the phase when the problem is put firmly on society’s agenda as a hotly contested issue often in a crisis atmosphere and often precipitated by a specific event that unmistakably reveals the issue in question. Typically this is a clear instance of the problem that cannot be swept under the rug — but sometimes it is the movement itself that creates this event. In this stage, many nonviolent actions take place and people across society are suddenly thinking about the issue in a new and urgent way. It is not a criticism to say that the anti-drones movement has not moved into this stage. It is still completing the task of “ripening conditions.” The work it is doing now is preparing for that moment. To this end, one of its current jobs is to think about how it will help catalyze this next phase and to accelerate its ability to alert, educate and mobilize the populace. This will hinge on finding creative ways to deepen and broaden the national and international conversation about a drone world – and to help sharpen the choice we have before us about such a world. The recent drones summit has made a powerful contribution to tackling this mission.